Singapore's H3 Dynamics has announced a neat little home for your drone when it's not in use, which it's calling the "Dronebox". That's the short description. The longer one, courtesy of the company itself, is: "A grid independent battery charging and data communication shelter for on-demand sensing drones routine inspections in the field, as well as provide a highly reactive 24/7 perimeter and border security solution." 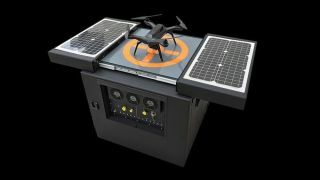 While the drone is away from its nest, solar panels mounted on top of the device charge up a battery. When it returns, that juice gets funnelled into the drone while the data collected during its flight is downloaded and sent back to a central command location. A live feed from the drone to the box to the operator is also possible in fast-response situations. The goal is to make drones more self-sustaining as flying sensors. "We have gone beyond the fixed sensor," said Taras Wankewycz, the company's founder, in an interview with Reuters. "We now have a sensor that has come out of its enclosure and moves." He added that the invention could have major impacts on costs and efficiency - particularly when it comes to oil and gas pipeline monitoring. Today, fossil fuel companies take more than 18 months to complete each inspection of their network - Wankewycz believes this could be brought down to a day. The next step, he says, is to work on the battery life of the drones themselves. Currently they fly for 20 minutes, and the company wants to improve this to an hour. Oil firms, government agencies, security companies and drone manufacturers have reportedly already expressed interest.